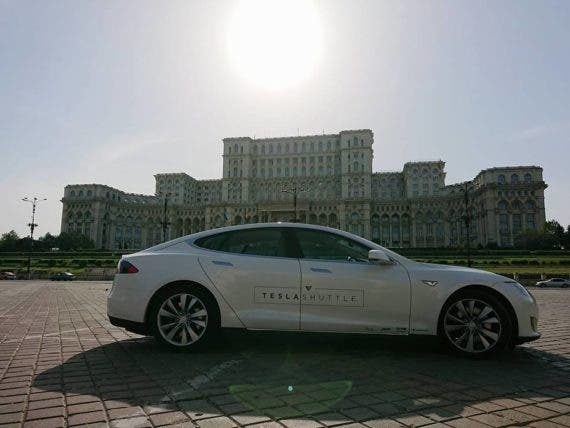 As we are receiving regular reports from Tomek and his fellow travelers, we can now put together a few stories from the first couple of days on the road with the Tesla. The most important news is there’s no real news — the first day driving through Poland was simply smooth and easy. There are two reasons behind this: Tesla’s range and GreenWay infrastructure. 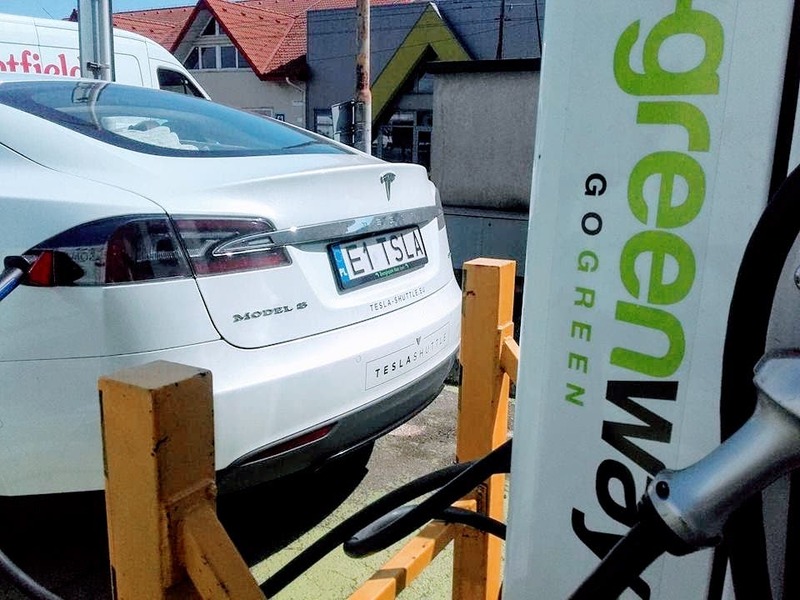 As Zach was already pointing out in the opening article, GreenWay has done a good job developing a network of fast chargers in Poland and Slovakia. It may still be challenging in a Nissan LEAF or Renault Zoe to get from charging point to charging point, but not so in a Tesla. Stopping at a gas station … not to charge. A GreenWay fast charger and our CleanTechnica Tesla. A heartwarming episode was staying for the night in a private lodging where the owner agreed to allow the Tesla to charge from a regular power socket at no extra charge. Was it just generosity or an understanding of how much (how little) energy the car actually takes — that charging overnight wouldn’t be like filling up a gas tank overnight. The generous home that let our driver/buddy charge overnight. It seems one of the critical things to teach people is that electric drivetrains are 3–4x more efficient and running a car on electricity is generally much cheaper than running one on gasoline. Normal people often follow the “fuel” concept, where filling up a gas tank is a significant cost. An overnight charge of a Tesla — not so much. 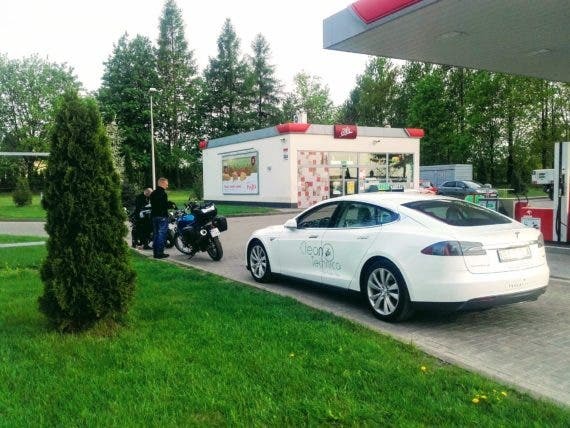 So, the second morning was an easy start for the gang of one Tesla and four motorbikes (ICEs) travelling together. It may be also worth mentioning there are three passengers and all the baggage is in the car. The car is packed full of stuff, but it has a ton of storage space, so that’s fine. The extra weight can play a significant role when you’re driving on your last kWh and the charger is not close enough. 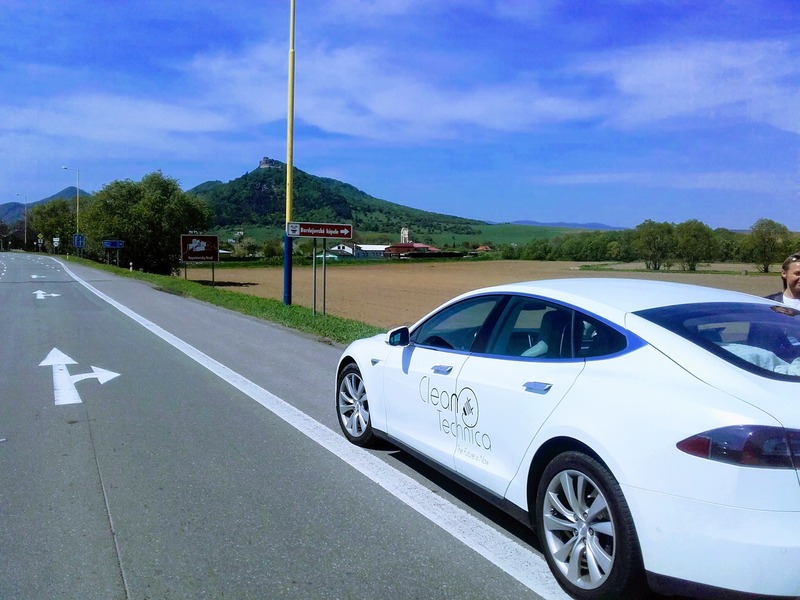 That, however, is for later stories, as our Tesla Shuttle had no problems leaving Poland and entering Slovakia. 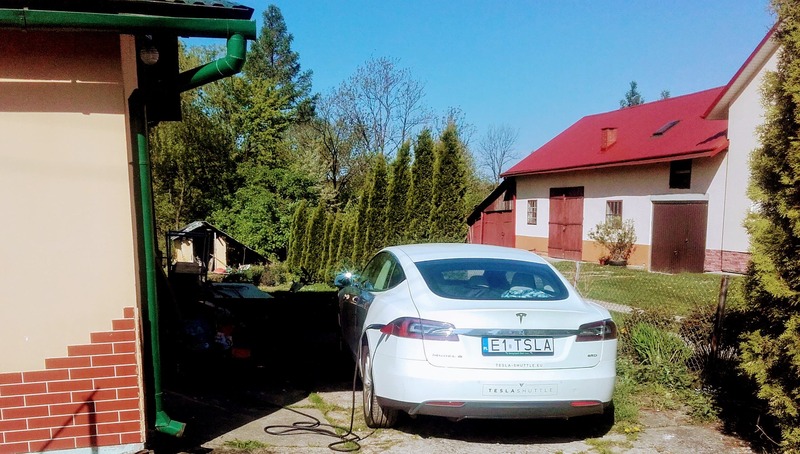 Slovakia is again a paradise for EVs in this part of the world. The reason behind it is the same as before — GreenWay. (Shouldn’t they pay us for saying all these nice things about them? 😀 ). Anyway, it was good to learn the GreenWay card from Poland worked in Slovakia, giving a sense of unlimited EV travel. Also, Slovakia is actually GreenWay’s homebase and birthplace. The company now has more chargers in Poland, but that’s another story or 10. That sense of freedom quickly disappeared entering Hungary and the city of Debrecen. 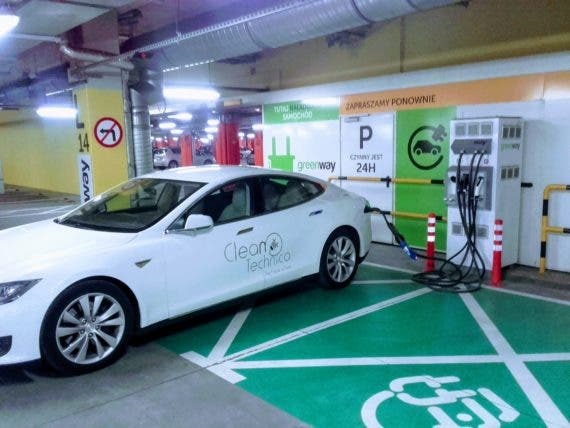 As Tomek is using PlugShare to locate chargers, he headed for a fast one from Nissan and E-On in a fancy underground parking garage. The charger was new and beautiful … but the moment they stopped, a guard came over shouting “no Tesla, only Nissan.” They offered to pay but were refused to charge anyway. 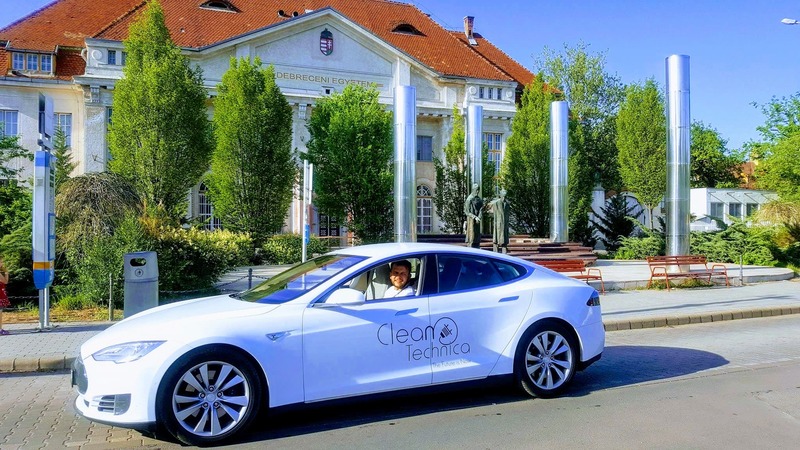 That is not to say you should avoid Hungary when driving an EV, but rather to show the difference between closed networks offered by OEMs, including Tesla, and open networks developed by independent companies. 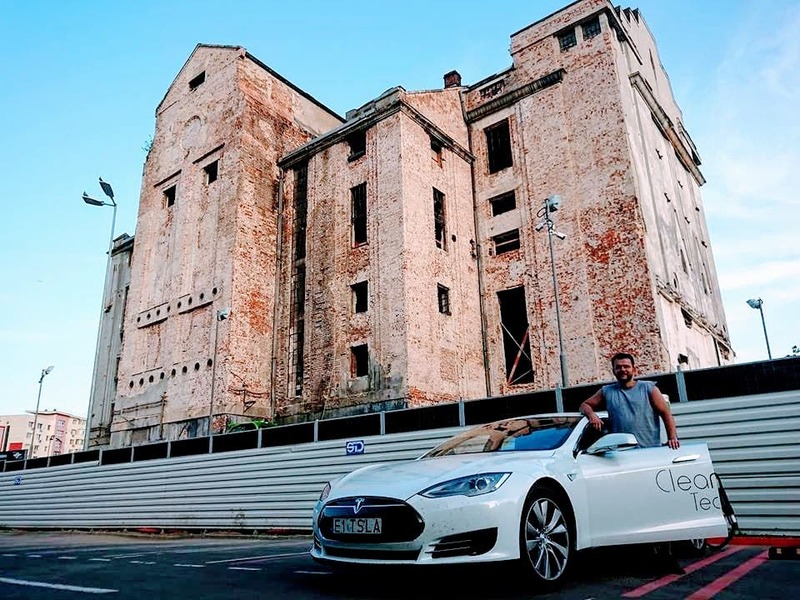 And there are probably good examples in Hungary as well, but our team didn’t wait to find them and followed PlugShare’s advice to head for a Kaufland supermarket in Oradea, Romania. Feeding a dog behind a Kaufland while charging. 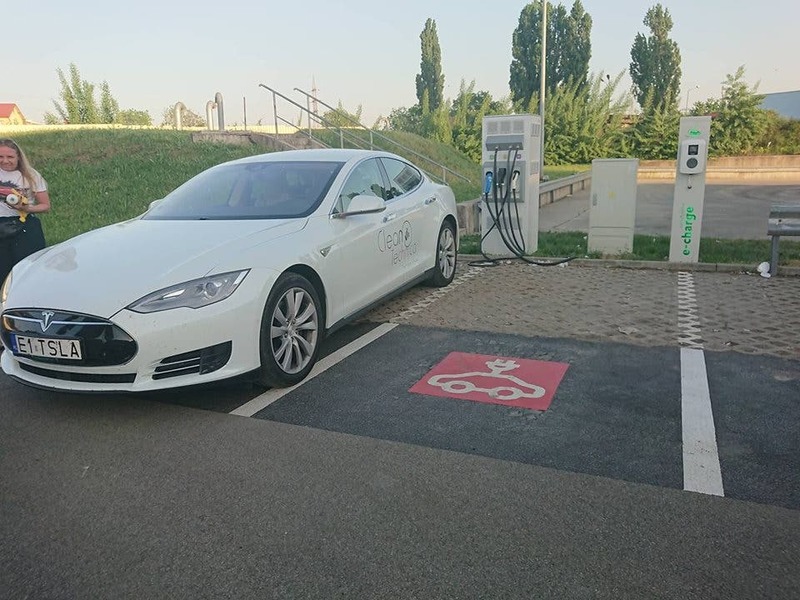 This time, PlugShare did a great job — Kaufland in Romania appears to have a nice network of chargers with friendly staff and an open approach. What a nice surprise! Super nice fast charger, free of charge, and Tomek was also given a card for free to use at other locations. 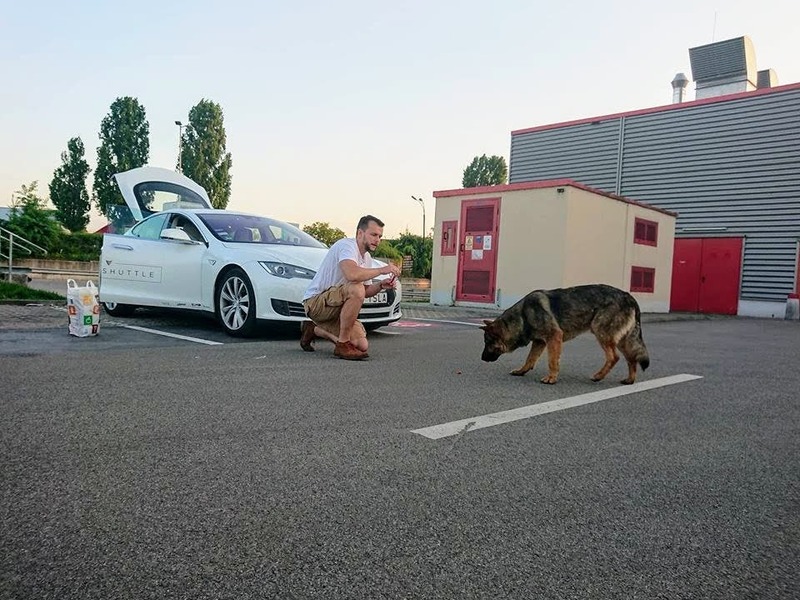 Generally, they have used Kaufland’s infrastructure several times now and, as you can see in the pictures, they made good use of the time making friends with locals (a little hairy ones) and getting some good sunbathing in (not sure it’s legal in public places in Romania, but …). We would be lying if we said they were all EV enthusiasts. It would be more correct to say they are mostly EV deniers. A good example was an elderly man who approached Tomek at one of the charging locations. Apparently, he used to work at a Jaguar plant in the UK and said there was no future for EVs. “They are too heavy” was his #1 complaint. It took several minutes of sharing facts and clarifying myths before the man finally agreed EVs could, maybe, become attractive for the younger generation — just not for him. “I’m too old,” he said. (It appears he will not be purchasing a Jaguar I-PACE). Similar low EV awareness became a challenge when staying for a night in a hostel in Cluj-Napoca. 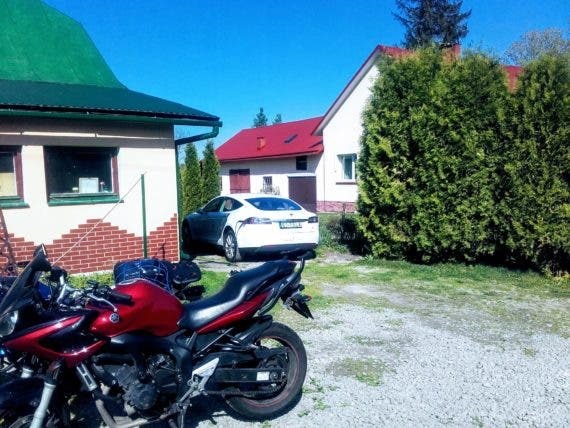 Nobody in the hostel knew how much electricity cost and how much to charge for charging a Tesla. 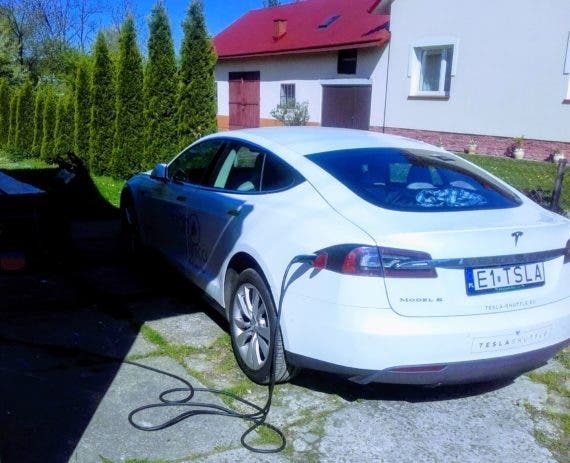 Google to the rescue and, after finding electricity rates and learning how many kWh the Tesla would take, they finally agreed to €5 for night charging. 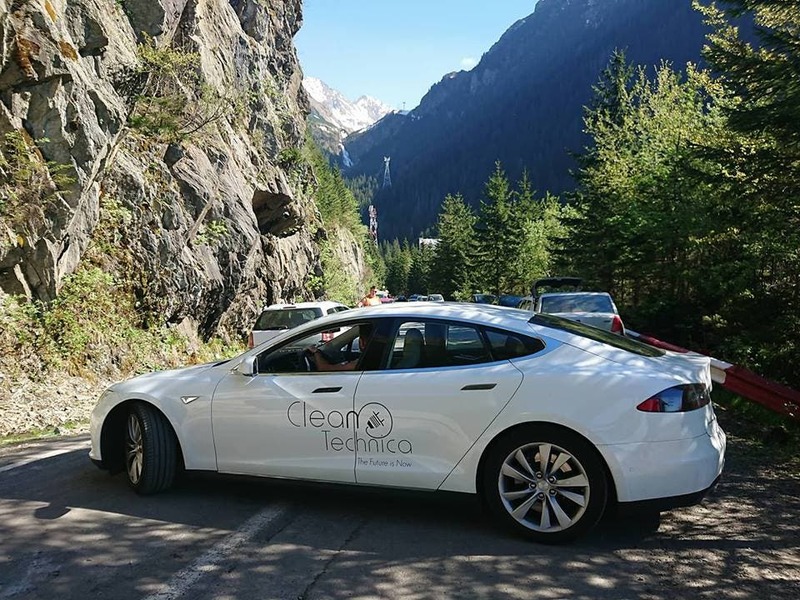 That is what the trip is all about, to a large extent — spreading good vibes about electric vehicles and helping people learn about them as much as possible. Another interesting charging experience included a new fast charger (not Kaufland this time). It was not clear what the conditions of use were. After connecting the charger, it first refused to charge and then started charging at a lower speed of 11kW instead of the nominal 50kW. Could that be another way of offering charging services? You can charge for free but slowly or pay and get access to fast or super-fast charging. Fair enough. Unfortunately, there was nobody around the charger to confirm that was the policy. It could, as well, just be an error or unintended operation. 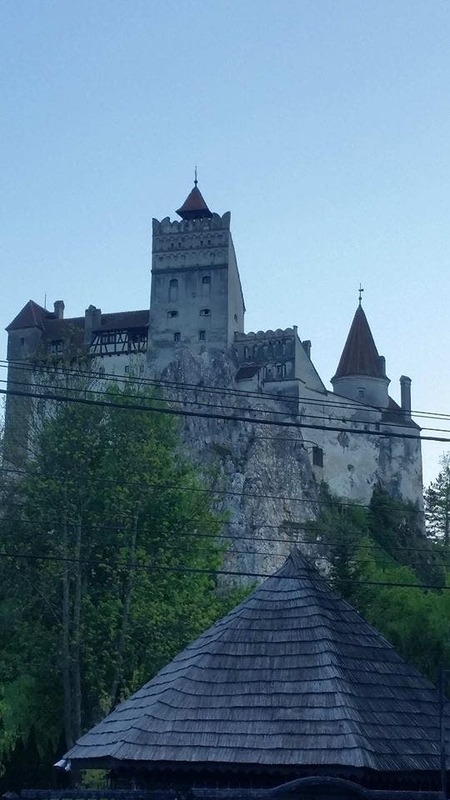 Romania offered spectacular views (including from the Transfagarasan Road, considered one of the most picturesque in the world, even by Top Gear), scary landmarks (like Dracula’s Castle), and many wonderful encounters. … as there was snow and road closed. Range wasn’t the problem. 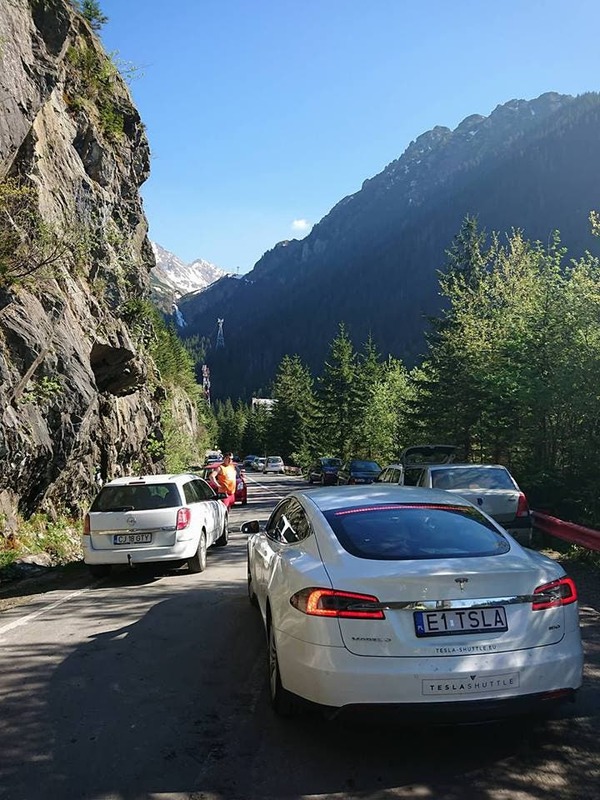 And, yeah, Teslas can do mountains. 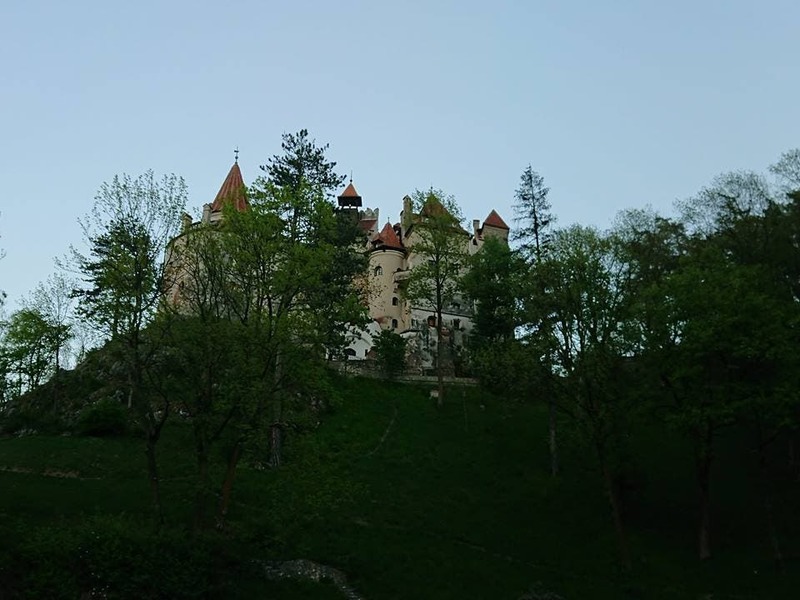 To see pics of Dracula’s Castle, the Romanian Parliament, monasteries the adventurers stopped at while driving across the mountains, and more shots of Transfagarasan Road, scroll down. More to come from the EV adventurers. There are still many kilometers to go.